We loved exploring all the things to do in Yeosu, South Korea while living here. Before we moved to this beautiful seaside town, the New York Times article “All Roads Lead to Yeosu” was our bible. Before this place gained notoriety for the 2012 Yeosu Expo, Koreans had long been traveling by train or road tripping from Seoul, Busan, and other places to chill here. Regardless of its fame, the small town charm is still real in Yeosu. Since we love this place so much, that’s why we wanted to share this guide with you, so you’ll know exactly how to enjoy Yeosu while staying here. This Yeosu travel guide is a part of our South Korea travel series. If you’re looking for a place to stay in Yeosu, or elsewhere in South Korea, check here for best hotels at the best prices. 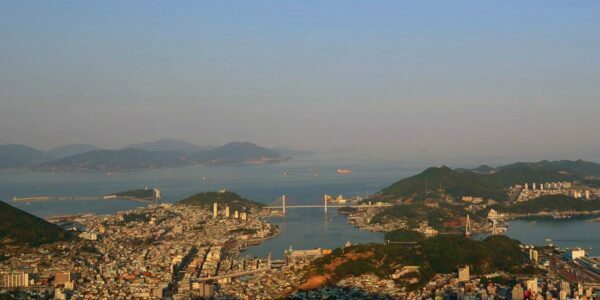 Ready to Visit Yeosu Now? Looking at Yeocheon from Seonso. For those traveling from Seoul or Busan, Yeosu may not seem like much but it’s a wonderful little peninsula within the Korean peninsula. Things are spread out and taxis to far off places can cost a lot. At the bottom of Dolsan or out towards Jangdeung beach, fares can reach anywhere between 20-30,000 won. If you want to see most of the places listed here, then you’ll need a car or taxi to reach them quickly. Yeosu’s Public transport isn’t bad when compared to rural parts of the country. Some routes don’t get as much coverage as others. Ease the burden of that car rental fee or taxi fare by traveling in groups of 4 or 8 so you can get the full value of the ride. There are quite a few nice hotels in Yeosu and I’d recommend staying around the Munsu/Yeoseo neighborhoods or Yeocheon. Bonus: Join the Yeosu Wayguks Facebook group in advance and find some friends who might be interested in your planned adventure. You’ll meet some cool people and save some cash along the way. You’ll find out immediately from stickers placed on restaurants and on buildings everywhere about Yeosu’s hosting of the midterm World Expo in 2012. Some people living in the city still grumble about the money spent on the event but for visitors, the massive park and surrounding pavilions are pretty cool for a walk on any day. Seasonal events are held at the comically named Big O and the surrounding Expo Park. Walk around the manmade island of Odongdo and spend your day surrounded by flowers and walking paths that to beautiful, romantic cliffs. The best time to visit for flowers (Camelias) is between November and April and for extra fun in the warmer months, groups can hire a motorboat for rides around the island. Bonus: Hike to the top of Maraesan (마래산) and you might get to see something out of a battleship game (see Instagram below) in the water. Oh and there’s a nice look at the whole Expo area as well. 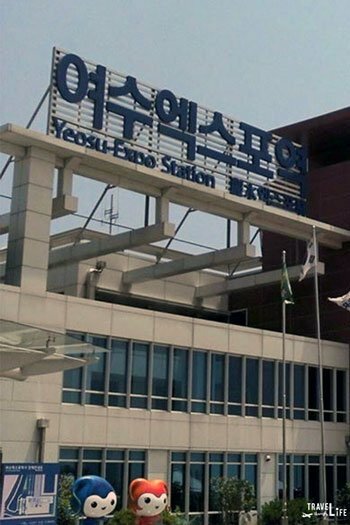 Yeosu Expo Station is reachable via KTX from Yongsan with one train coming from directly from Seoul. Check here for more info. For Odongdo, you can take walk from the KTX station but if arriving at the Intercity Bus Terminal, bus 333 will drop you off near the entrance. A taxi will cost about 5,000 from the terminal to Odongdo’s entrance. If you’re hungry, you’ll easily find markets filled with people hawking all sorts of good food, cheap clothes, or even home appliances—if you’re lucky. The most active area is around the West Market (서시장 or Suh She Jahng) in the Jungang Dong area. That’s near the Yeosu Coastal Ferry Terminal. Stand on one of the turtle ship walkways and peer down into the adjacent market and just watch it all go down. 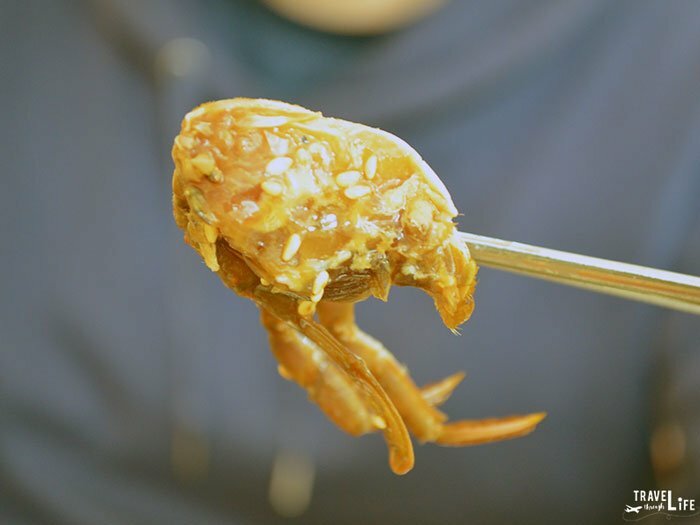 Seafood lovers should stop around Yeosu’s Gaejang Street and get some marinated raw crab, which might shock your palettes at first before realizing it’s actually tasty. One of my favorite non-seafood takeaway items was a whole fried rotisserie chicken that’s perfect for a beach day. Just make sure your exercise regiment can prep for the pain that’ll come the next day. Bonus: There’s a cool restaurant in Yeoseo Dong that serves steamed oysters in the colder months and is a really great place to stay warm while eating some of that mood-setting food. To reach the West Market, buses 88, 28, 82, 80, 999, 111, 666, 73, or 7 will get you there. Be sure to catch the bus on the opposite side of the street from the terminal. Buses 666, 999, 111, 61, and 18 will get you to a stop (국동주택단지) across the street from Gaejang Street. Taxi to both will cost about 5,000 won. Yeosu is just like the rest of Korea and is shaped by mountains with neighborhoods clambering for space throughout. With such a wealth of mountains and being so close to the sea, you can easily find some of the country’s most spectacular views. My personal favorite is Gubongsan (구봉산). Its wonderful sunset views of the harbor and islands in the distance are just wonderful! Stick around until nighttime and don’t worry about the way down. The paths are lit since so many people come up for a look at Yeosu’s famous night view. Other winning hikes are Yongchwisan (영취산) when the azaleas are out or Bonghwasan (봉화산) on clear days for gorgeous looks at the water. Bonus: Coastal hikes around Dolsan are highly regarded no matter the time of year. Not far from Yeocheon, one of my favorites was Ansimsan (안심산) that overlooks the bay around Soho Dong and Ungcheon. Gubongsan’s hiking trails can be reached after about a 25-minute walk from the Intercity Bus Terminal. Just walk towards Emart and make a left at the next major intersection. Continue walking until the first roundabout (rotary), where you’ll make another left and will then continue before walking directly towards Gubongsan. Be sure to cross the street because you’ll be arriving at one more roundabout. From there, you will need to cross again to reach Gubongsan’s trails. You can walk along the main road that passes the rotary and enter from there or you can enter via stairways that are seemingly everywhere along the road before the roundabout. For Bonghwasan, buses 73 and 6 will take you to differing entrances with 6 leading to the prettier one that will lead a view that overlooks a reservoir. It’s all gorgeous so bring your best camera for a truly spectacular scene. Yongchwisan is reachable by first going to Heungguksa Temple that can be reached via Bus 52. Taxis here can reach 13-14,000 won so bring a group or plenty of cash if you don’t have time to wait for the bus. If hiking isn’t your thing, don’t worry. Hyangiram is reachable by bus and a short walk. It’s also the best-known temple in the area. 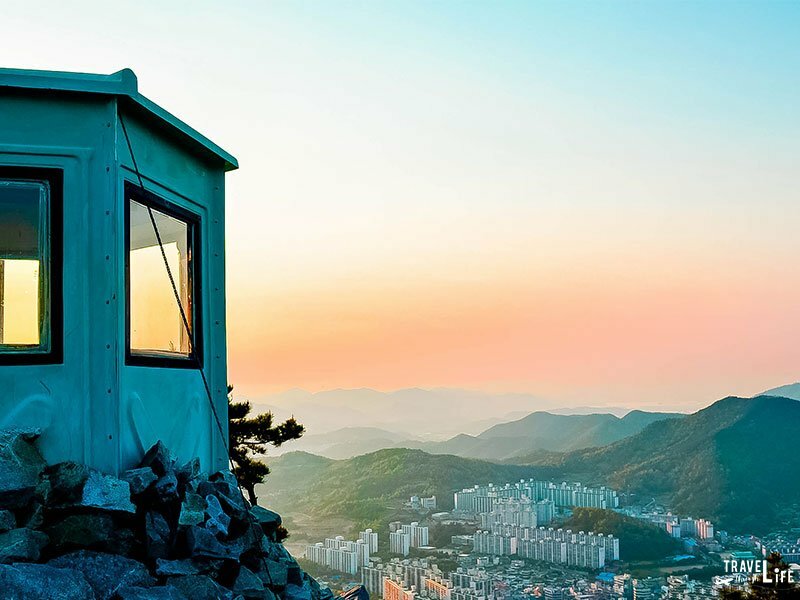 People throughout Korea also know it as a great sunrise spot on New Year’s Day. After spending some time at the Expo and Odongdo, make your way into Yeocheon and walk around Soho Marina and Seonso Shipbuilding Yard., with the latter dating back to the 16th century. 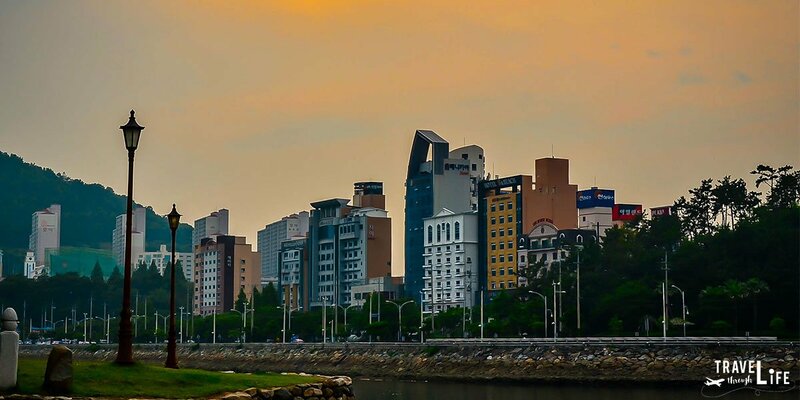 Another favorite of mine is the harbor area and neighboring Haeyang Park. Both are pretty areas for a nighttime stroll in my opinion. Walk back and up a couple of blocks and if it’s not too crowded, Jinnamgwan will remind you of the trailer for Roaring Currents (명량), a movie that made Korea the only country where Guardians of the Galaxy didn’t rank #1 over its opening weekend. Peeking through Jinnamgwan to Yi Sun Shin Square. For Hyangiram, buses or groups in a taxi are best. The ride can take an hour or so and buses 111, 999, 6, 7, 21, and 113 will get you out there. For Seonso, take Bus 88 from the Intercity Bus terminal and get off at Buyeong Sam-Cha Apartments. Take a left at the Buyeong Four-way intersection and walk ahead about 700 meters. You should be able to see the yard by then. Taxis will know Marina Buffet (마리나뷔페) or Seonso (선소) and should charge about 7,000 won for the trip. Haeyang and Harbor-bound travelers should take the 555, 82, 111, 666, or 999 buses from the opposite side of the bus terminal. Taxis out there run about 5,000 won and drivers will know 해양공원 and might need an extra “Café Bene” to jump-start their memories. For those with a car or a group of friends to afford the taxi ride, head to Wind on the Hill (Translated from언덕에바람, Instagrammed below) on Dolsan for Yeosu’s best coffee or organic tea with a view. Here’s the address: 전라남도여수시돌산읍돌산로717. Aside from the better coffee coming from Yeoseo Dong’s Café Imi and others, this place is the best for a cup of Earl Grey or Americano. 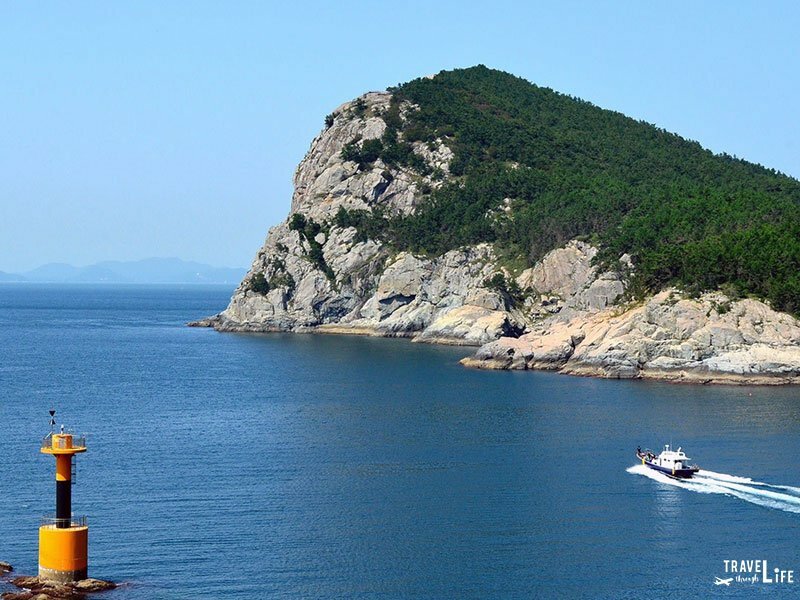 Geumodo Island, a great place for hiking! Whether you’re searching for beaches or the right hike, Yeosu’s packed with over 300 islands that will accommodate everyone! Dolsan is the biggest one. A beautifully ornate bridge connects it and plays a big part in that Yeosu Night View people rave (and even sing) about. At least three ferry terminals will get you to the others. There was even news about getting to Jeju from Yeosu. Island highlights are Geumodo for trekkers and Sado for those in search of some beach time or some dinosaur bones. Geomundo mixes seaside views with a little history but is a bit harder to reach and farther away than the others. Bonus: These three are just the start of what can be a wonderful island getaway from Yeosu. A great start to get you around would be the Hedgers Abroad island hopping guide. Dolsan Highlights include the bridge (photo below), the already-mentioned Hyangiram (see Watery Scenes Everywhere) and some nice beaches. Bangjukpo was always my favorite there. For islands, Yeosu’s Coastal Ferry Terminal is the closest to the bus terminal. It will get you to Geomundo. Shingi and Baekyado will get you to Geumodo and are a bit of a hike to reach. Buses 109, 21, and 114 will get you to Shingi but should take about an hour at least. Taxis there will cost at least 25,000 won. Baekyado-bound buses include 26, 27, and 28. Expect 1 ½ – 2 hours before arriving by bus. Taxis there also run about 25,000 won. 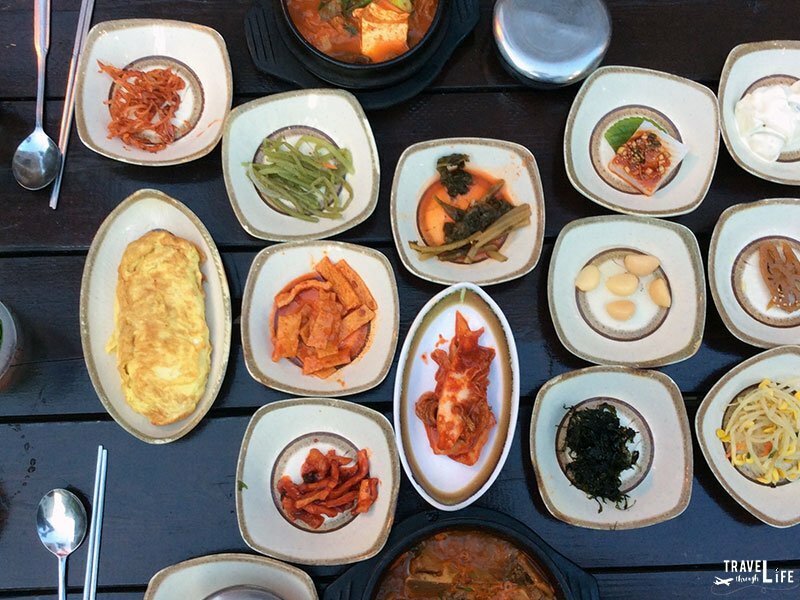 Those looking for an authentic eating and drinking experience after the markets should start with Yeoseo Dong. Look to places like the foreigner-famous “Soup Tent” (동트닌집) for some awesome hangover stew or bulgogi. If you prefer cleaner and more pristine places to hang out, Ungcheon and Yeocheon have some barbecue and other standard Korean food. Budget travelers will find Mipyeong Dong a bit harder to navigate considering it starts at the bottom of a hill that leads into Chonnam National University’s Yeosu Campus. A few places close when school isn’t in session (July-August and December – January) but Dae Dong Guksu (대동국수) is a big hit throughout the year. Here’s its address for Taxis: 여수시미평동758-4. Bonus: There’s a really awesome restaurant by Chonnam’s Main Gate (전남대정문) that’s only open when school is in session but serves some of the best spicy pork (제육) I’ve had. It’s not far from the CU and really cheap (5,000/person), with unlimited self-serve lettuce and not-spicy peppers. Directions: Ask some foreigners in the Yeosu Wayguks Facebook Group and they’ll point you towards Soup Tent. Ungcheon (웅천해수역장) is easily accessible from the Intercity Terminal by buses 82 and 61. Taxis get you there from the same spot for about 6,000 won. Yeocheon is easier to reach when getting off at the first stop after arriving in Yeosu or from the Yeocheon KTX stop. You can tell a taxi to let you off at the Yeocheon Starbucks. You’ll then be near all the good restaurants in the area. Cross the street away opposite Starbucks and Turtle Park and after cutting down a side street, you’ll be right in the middle of it. There are other beaches at Ungcheon (see Eat and Drink like a Local) and Manseongri but my favorites for camping and pensioning are at Mossageum (모사금, Instagrammed below) and Jangdeung (장등). 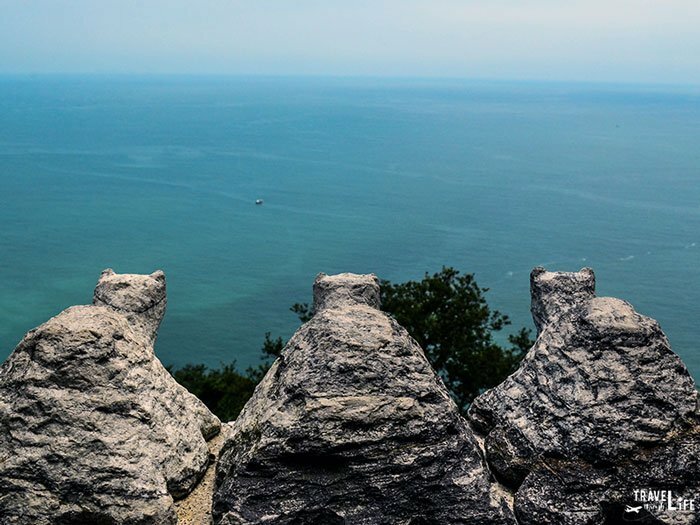 Both are also pretty cool for an afternoon in the colder months and as long as you can bundle up in preparation for some epic wind, you’ll get a day at some of Korea’s most picturesque seaside landscapes. Jangdeung Beach also appeared in our feature on Spring Things to Do in South Korea. Mossageum is closer than Jangdeung by a mile or 20! Buses 6, 7, and 999 will get you to Mossageum Beach. A taxi will take about 25 minutes and 8-10,000 won from the Intercity Bus Terminal. Jangdeung is reachable by buses 26-1, 27, and 29 and will take about 1 to 1-1/2 hours. Taxis are faster but also run about 25,000 won from the Intercity Bus Terminal. 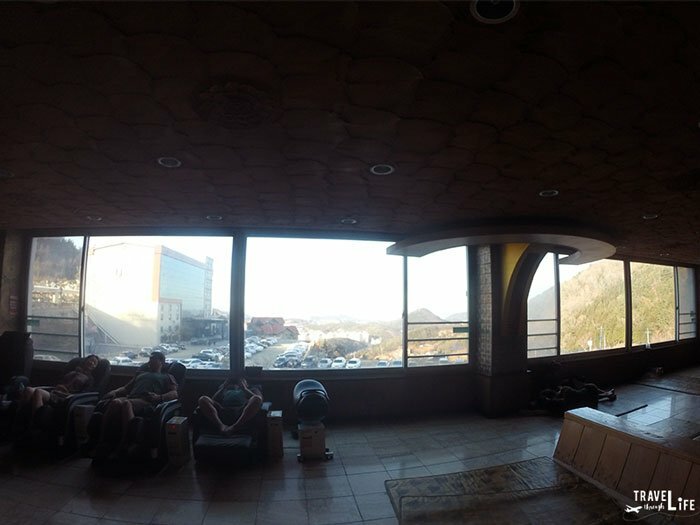 Get really warm at a sauna during Korean winter. You can easily find a basic sauna attached to a fitness center but there were few that I came away with an “I’d go there again” feeling. The MVL Hotel (pronounced “Ehm-vuhl) is the only one where I could find with an outdoor pool and with free swim trunks available! The Ocean Resort gives visitors the best views behind glass and if you’re into staring at rocky islands while in the buff, you know where to go. Bonus: Find Yu Simcheon (유심천운천리조트) and experience that wonderful kiln-style sauna that you’ll rave about after visiting. Step outside the kiln in the winter and watch the steam leave your body. Pack a waterproof camera that can take the heat and video the whole process. Address for Taxis: 전라남도여수시소라면안심산길155. 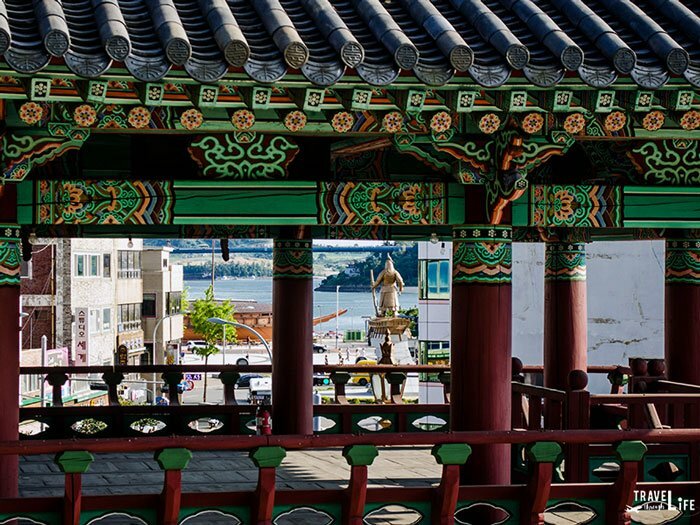 We’re big fans of Yeosu, especially for the cool places that surround it. 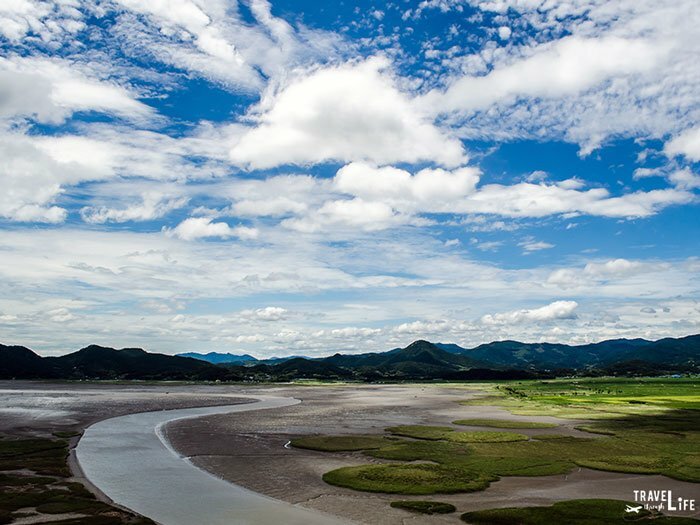 Suncheon neighbors Yeosu to the north is home to the immaculate Suncheon Bay, the festive Nagan Folk Village, and the Jogyesan Philosopher’s Hike. Boseong is known throughout South Korea as the home of green tea and there’s a plantation that you can visit throughout the year, especially in the winter when they turn the lights on. Gwangyang is better-known as an industrial town but lots of people drive around its river valleys in search of a spot to chill out and relax in summer. 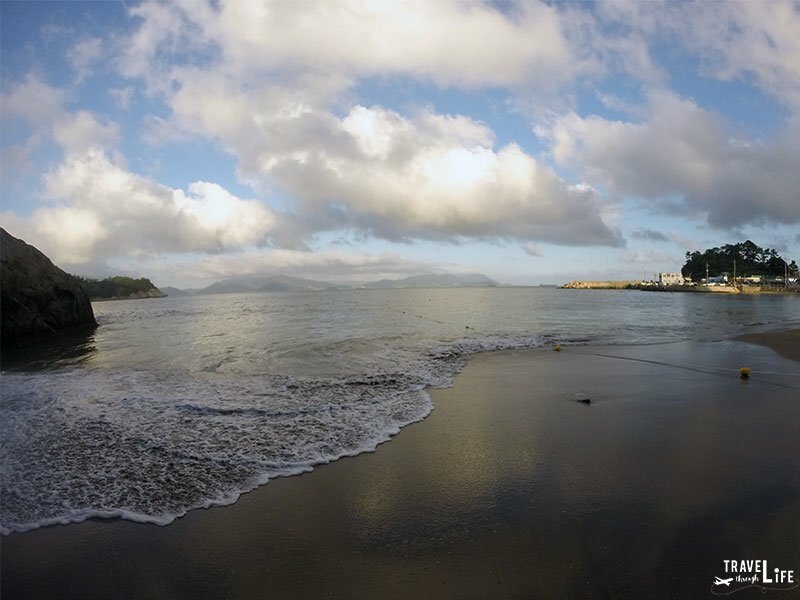 Got another favorite spot near Yeosu that you’d like to share? Let us know in the comments section. 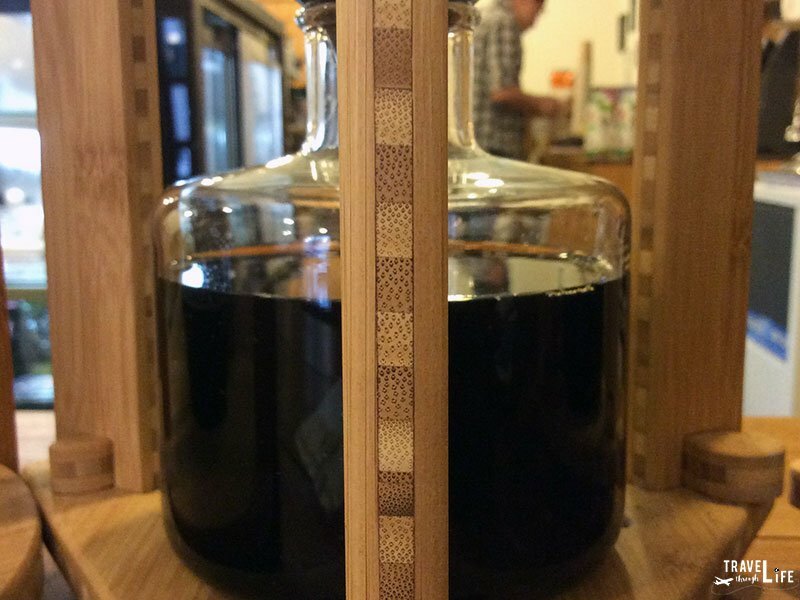 Yeosu is a small city by Korean standards but every day, there’s a new restaurant or coffee shop that’s opening in the hopes of being the next great thing. I keep a close eye on things going on there so have no fear. This guide to Yeosu will help you enjoy my home away from home in a better way than just showing up and staying there for a weekend. Ever been to Yeosu? Got a suggestion or correction to mention? Feel free to leave a comment and let us know! Special thanks to Korea Tourism and Naver Maps for help with narrowing down the directions.This Yeosu travel guide is part of our series on South Korea Travel and East Asia Travel. It was originally created on October 16, 2015. It has been maintained and updated (as of December 28, 2018) to reflect current viewpoints and travel trends. Great article Carl. 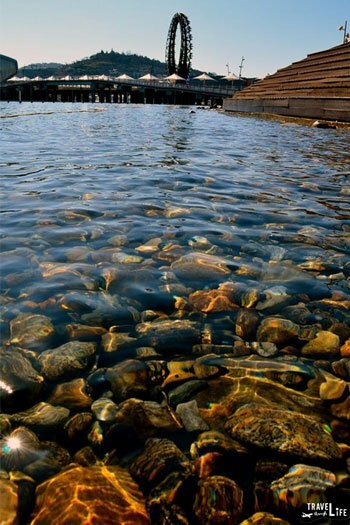 Yeosu is truly a hidden gem for so many travellers. Not near enough westerners make their way to Yeosu, rather choosing more well-known Asian destinations. Writing pieces like this will build awareness and increase exposure of this quaint, beautiful and peaceful Korean seaside city. And you’re right on the money when it comes to Yeosu’s extremely high quality of seafood. Cheers from Yeosu! Thanks, Ryan! Since you live in Paradise throughout the year, I think Yeosu would be right up your alley:) Maybe one of the islands outside it would be perfect for you guys. That’s just a hunch I have. No howler monkeys though:( 2 out of 3 ain’t bad though, right?